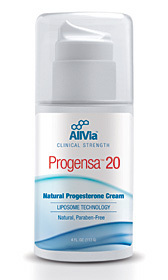 One of progesterone's most important and powerful roles in the body is to balance or oppose estrogen. When progesterone levels are in balance the body handles any excess estrogen. When the body has too much estrogen it is considered estrogen dominant. Estrogen dominance occurs when women have normal, deficient or excessive estrogen but little or no progesterone to balance out its effect on her body. Therefore, even a woman with low estrogen levels can have symptoms of estrogen dominance if she is not producing enough progesterone. Weight gain, especially around the abdomen, hips and thighs. Estrogen dominance can start early in a women's menstrual cycle. Young women who are estrogen dominant may experience early onset of menstruation, painful menstruation & depression. Often these young women are put on the birth control pill to regulate the symptoms. Then, the many negative side effects of hormone replacement theapy (HRT) become a real concern. Some women develop estrogen dominance later in life, sometimes as a result of diet, liver impairment or environmental factors. Xenhormones are man-made substances that are foreign to the body and have a hormone-like effect. Most xenohormones have an estrogen-like effect and so are sometimes referred to as xeoestrogens. Unfortunalty many of these substances are now found in our food supply. All of these symptoms can greatly improve and even be reversed by balancing the estrogen dominance with bioidentical progesterone. One of the best sources of Bioidentical Progesterone is wild yam (Dioscorea Villosa). Wild Yam contains a compound Diosgenin which is the active biochemical constituent with progesterone properties. This herb has been used for years as the base for synthetic hormonal drugs which when put through the chemical process create more harmful side effects when taken. However, in its natural unadulterated form, Wild Yam can work WONDERS. But if it's so wonderful then why don't you hear more about it? The answer is easy! No chemical processes means no patents. The pharmaceutical companies cannot make huge money on an herb that exists commonly in nature and doesn't require chemical alteration. Therefore, by law these type of products cannot be patented. The pharmaceutical companies would rather process products and fund studies that support these products even when a viable natural option exists. May drugs produce cause side effects which are combated by another drugs sold by the chemical company to combat the side effects of the first drug and so on. The results: A damaging viscous downward cycle of health. Strictly speaking, it's possible that we are all--men, women and children--suffering a little from Estrogen Dominance, because there is so much of it in our environment. You would have to virtually live in a bubble to escape the excess estrogens we're exposed to through pesticides, plastics, industrial waste products, car exhaust, meat, soaps and much of the carpeting, furniture and paneling that we live with indoors every day. You may have on-and-off sinus problems, headaches, dry eyes, asthma or cold hands and feet for example, and not know to attribute them to your exposure to Xenohormones. Over time the exposure will cause more chronic problems such as arthritis and premenopause symptoms, and may be a direct or indirect cause of cancer. For many women, bioidentical progesterone cream provides significant relief from symptoms related to shifts in the female hormones estrogen and progesterone. It is also known that transdermal application allows for easier absorption because with any oral medication or supplement the health and state of the colon can compromise its effectiveness. Bioidentical progesterone provides a safe, pleasant and efficient way to help the body help itself. It's the way nature designed the body to work.